Should you be searching for a party bus in Berkley, then rest assured that your search will now have finally come to an end once and for all. We here at Rockstarz Limousine and Party Bus, are experts at not only providing a quality service, but we will also make certain that everyone at your party will have an amazing time from start to finish. If this is your first time of looking to rent a party bus, then you will clearly have a number of things to take into consideration. You may also be concerned with the number of guests that you will be able to invite along, but that is where the layout of our party bus really does come into its own. Not only have we sought to make the best possible use of the space, but we have also included various leather seats to allow individuals to chill even as the party continues around them. Our Berkley party bus rental service is designed to provide you and your guests with the best possible atmosphere from start to finish. As soon as you step on board, you will feel as if you are in your very own private nightclub that will then cruise around the streets while everyone on board can let their hair down. Our bus also comes with a stunning sound system, which is an absolute necessity for any party. In addition, we have included various lights and a laser system that just takes things to a whole new level and helps add to that feeling of being in your own nightclub. 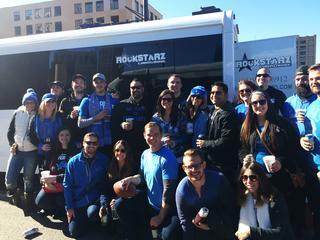 Previously, people have taken advantage of our Berkley party bus service for a number of different reasons. Not only have they used our services for a number of different special birthdays, but there have also been various anniversaries, celebrations, and even bachelor and bachelorette parties. No matter what the reason may be, you can rest assured that we will be able to help you and provide you with the perfect location for your party. So, if you live in the Berkley area and are looking for a party bus, then contact us here at Rockstarz. As well as calling, you can also contact us via our website, and a member of our team will then be in touch as soon as possible in order to discuss your own individual requirements.